Here at Organimi, we are constantly working to improve our platform and bring new value to our customers. 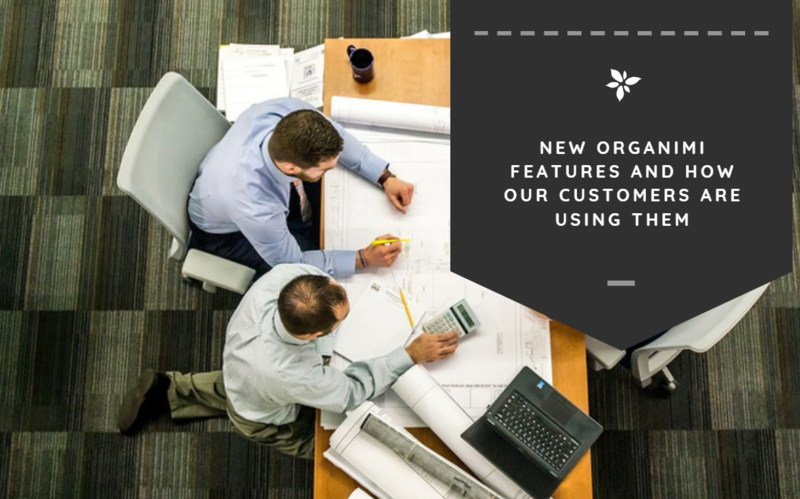 Our latest update contains a number of features that extend the functionality of the Organimi platform and give Organimi customers new tools that they can use to search, display, and update their existing org charts. In this blog post we’ll be covering these features and providing some use cases where they may be valuable. One of the ways that we have been looking to improve Organimi’s platform is through search. We want to make all information included in a given org chart easy to find, search through, and update. Previously, you would have been required to search through your org chart by hand in order to find information about a specific role, person, or department. 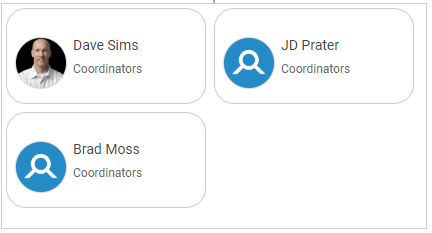 Our search feature now allows you to search for any information that is contained within a role card. This makes it easy for larger organizations to find specific people in their org chart without having to spend the time sorting through all of their entries and clicking-and-dragging around their chart. But you aren’t limited to searching by name! In the above example, you can see how useful this feature could potentially be. 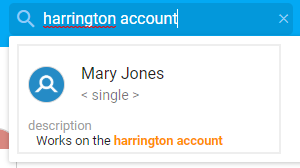 By including relevant information in a custom field (such as the account that an employee primarily works on in the example above) you can make it easy to find the right person for the right task. 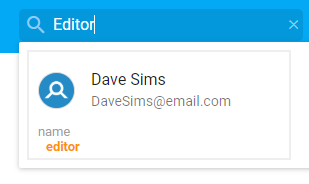 You can search for any information contained in your role cards using the search feature now. Yes — any data. We believe this will make Organimi org charts easier to use, making things simpler to manage for large organizations. When we first launched our “Shared Roles” feature, it quickly became one of our most popular feature rollouts. In short, shared roles allow a company to list several employees under the same role. There are lots of reasons why you may choose to group employees under a single role. First, it can help to make the org chart feel more organized. Maybe several people with the same role are working on the same project, and you want to make that clear on the org chart. Maybe you want to keep specific role types together for organizational purposes. 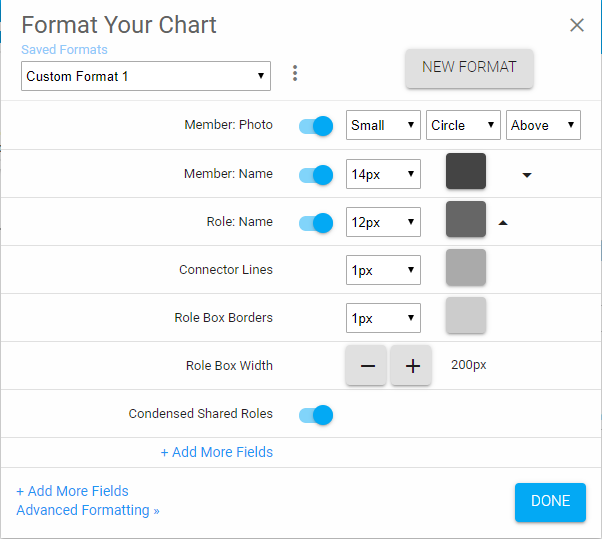 This is a great way for anyone that is using the “Shared Roles” feature to save space on their org charts. For shared roles that have a lot of members, this is a critical feature. 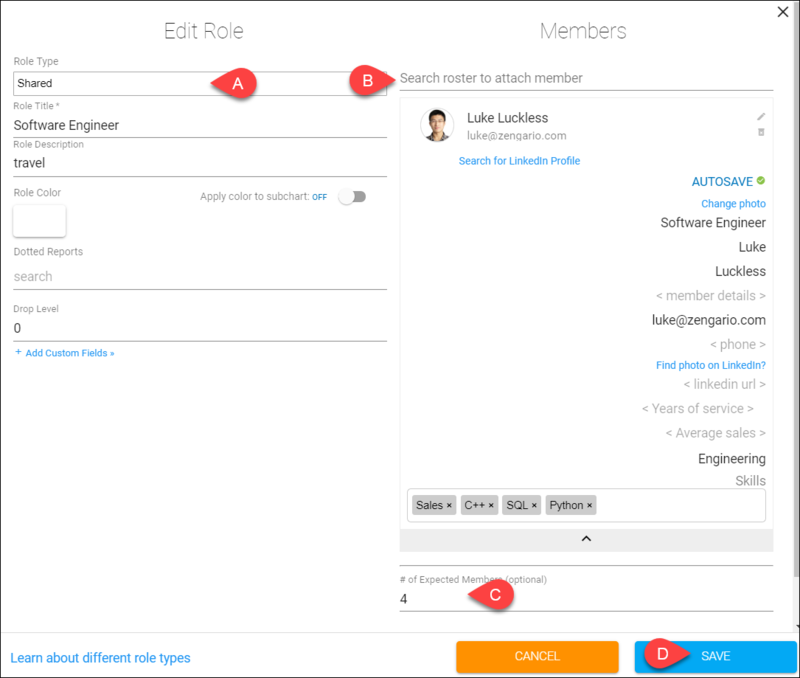 Our new role sorting feature is in the spirit of a lot of the features that we are debuting in this post. Role sorting provides a simple but powerful way to change the way that your org chart is displayed. Using this feature will make your org chart easier to sort and provide more use cases where it will be useful within your organization. You can access role sorting by going to Settings > Chart Display, and finding the “Role Sorting” feature at the bottom right of this screen. 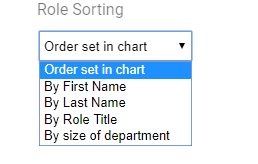 By default, sorting by the size of department displays the departments with the fewest employees first, and those with the most employees in roles last. We strive to make re-organizing your chart and moving people around as simple as possible in Organimi. 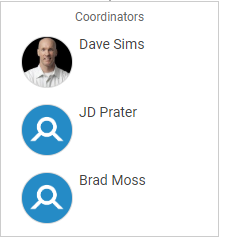 Our drag-and-drop interface makes it easy for you to change the role, location, or interdepartmental placement of anyone on your chart. But, we noticed that as org charts grew, it became difficult to move cards around on the screen. It required a lot of scrolling, which was tedious. To fix this, we developed a new feature for moving employees around on your org chart outside of the drag-and-drop system. 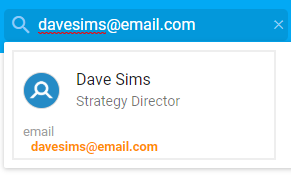 To use it to move a card, hover over the employee that you would like to move and click the 3-dot “Role Actions” button. Then click on “Edit Role.” At the top of the screen you’ll see the manager designation for the employee. There, by clicking on “(change),” you can assign the employee to a new manager, changing their placement on the org chart. When you have large org chart with hundreds or thousands of employees, it can be difficult to find a specific person. Before this update, we didn’t have a simple way for you to sort through your many employee cards to find a specific person. 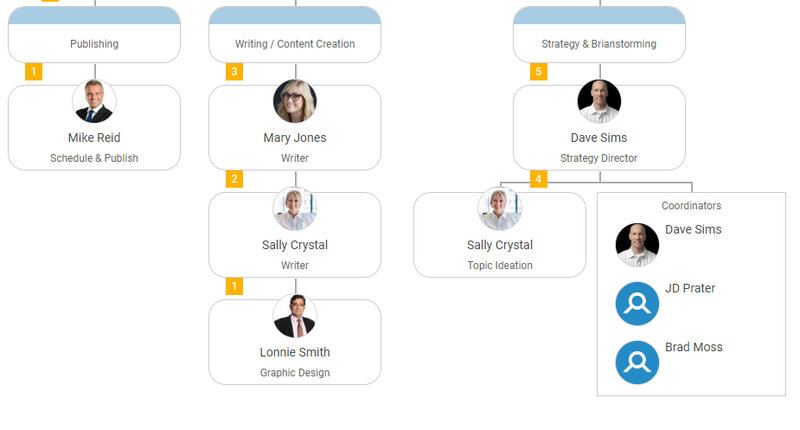 Now, we’ve added a simple one-click feature that immediately takes your screen to your chosen employee and highlights their card on your org chart to make them easy to find. You can do this by hovering over the employee listing in the left sidebar. A spyglass icon will appear. When you hover over the icon, a “Find in Chart” notification will appear. Click it, and you’ll be taken to that employee’s position on the org chart and their card will be highlighted. 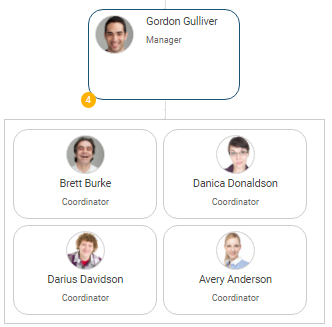 This new feature provides a simple and effective way to sift through your org chart to find a specific employee. No more endless scrolling as you try to spot the person! Sharing is perhaps our most important feature. It’s what enables our system to be deployed throughout all departments in organizations and for org charts to have more reach than they would being stuck on an intranet. 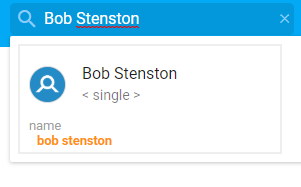 In our latest updates, we improved sharing by having our system automatically find the card for the person that you share your org chart with, and start them on their own card when they view the chart. To explain further — if you share the chart with Susi from accounting, when she opens the org chart it will open at her personal employee card. This makes it easy to share org charts with new employees to help them better understand their departments makeup. These improvements represent a solid step forward for Organimi as a platform. Aimed at simplifying some of the most common tasks undertaken in the Organimi system, these updates should help organizations large and small to create, update, and share org charts internally in a fraction of the time it would take in another system.